It's winter, we've had the house in Arizona for two years now so it was time to clean the dryer vent. What should have been an easy project has turned into a mess and I'm not happy about it. All I had planned to write about in this blog post was how to clean a dryer vent. Instead I feel like I'm back running a handyman business and dealing with construction issues. The problem is we have no idea where the dryer vent exits the house. That means the vent probably ends in the attic, a common builder shortcut to save money. While lint in an unfinished attic isn't a huge problem, the moisture in the air is a problem (remember dryers remove water from your clothes). This moisture can reduce the effectiveness of your insulation and if the ventilation isn't adequate, there is the possibility of mold growing. 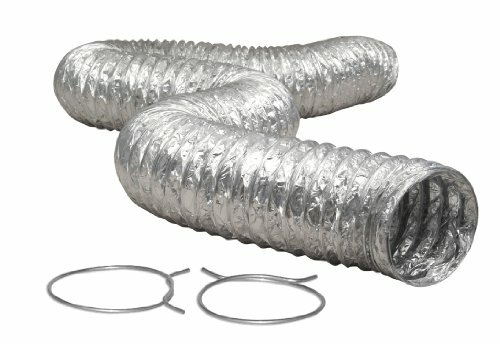 Where Does the Dryer Vent Exhaust Out? Now that you understand why dryer vents can't be ignored, let me share more insight into best practices for installing dryer vents. Why best practices? Because building codes are difficult to decipher and they vary by state and sometimes local ordinances. For example, my handyman business got lots of jobs when New Hampshire required rigid vents versus the accordion style that traps lint in it's folds. The dryer vent connectors below illustrate the different types of venting available. New Hampshire made the flexible venting (on the left) illegal. My handyman business replaced at least 40 of these inexpensive and unsafe vents. When Lowe's delivered and installed our new dryer, they tried to use the flexible connector. I told the installer no, that this was not legal in New Hampshire and I wouldn't accept it in Arizona. After showing him the receipt proving my husband had ordered the vent tite kit, he miraculously found the kit in his truck. My guess is he purposely didn't bring the right connector in with his tools, because it's harder to install and he was trying to save time. How do you know if your dryer vent is safe? Here are the dryer vent safety guidelines from the International Association of Certified Home Inspectors (InterNACHI). Make sure the connection between your dryer and the vent is secure. Only use a high temperature, UL approved tape to seal the seams. Make sure the air flow is not restricted. 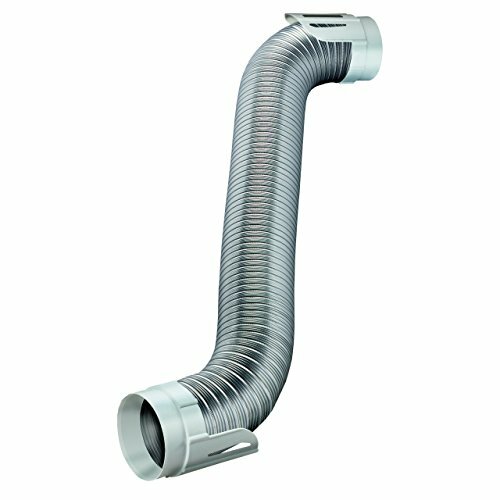 Flexible ducts can get crushed and restrict air flow, which is why rigid venting is better (or use specially designed elbows). 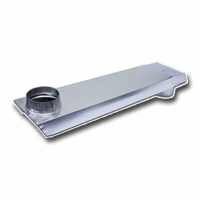 Exhaust ducts should be made from rigid metal (minimum of 0.016 inches). They should have smooth interior surfaces and no screws should extend into the duct. For each 45 degree bend, subtract 2.5 feet from the length of the duct. For each 90 degree bend, subtract 5 feet from the total length of the exhaust duct. Exhaust ducts must terminate on the outside of the building, at least 3 feet from any openings like windows or doors. So clearly my dryer vent doesn't satisfy these guidelines. There's a 90 degree angle where the vent tips up inside the wall and it's almost 13 feet to the attic. This leaves 7 feet in the attic. A straight vertical run to and through the roof would work, but I'm not inclined to punch through a tile roof. Where I expected to find the dryer vent door (dryer 4 to 6 ft away). Checking the direction of the dryer vent inside the wall – up! Trying to find the dryer vent in the attic – metal center bottom? Using binoculars to find vents on roof? Most homeowners think cleaning the dryer vent is nothing more than the lint filter. That's one of three places where you need to remove lint from your dryer and it's vent. So here are the three steps you need to take at least once a year, or more if you're running your dryer several times each day. Clean the lint filter every time you use the dryer. You already know and do this and yes, I purposely didn't so I'd have more lint for my photo. Clean the dryer cavity where the lint filter sits, to get rid of lint that isn't caught by the filter. If you keep your lint brush handy, you can do this monthly. Clean the dryer vent from where it leaves the dryer, to where the air, lint and moisture leaves your home. This is a new house and oops, I left my dryer vent brush behind my old dryer. That meant some research and a trip to the store. I decided to get the LintEater Rotary Dryer Vent Cleaning Kit because we have really tall ceilings, making it difficult to maneuver manually. Their system provides brushes for steps 2 and 3, plus extension pieces so we went up 15 feet for now. Long vent brush for getting into the dryer cavity (step 2). Short rotating brush that cleans off the interior surface of the dryer vent (step 3). Flexible rods (3 ft increments) to work through your entire vent system (step 3). There's also hardware so you can attach your power drill to the rods. Blockage tool if you find a clog somewhere in your dryer vent (step 3). Components to allow you to attach your Wet Dry Vac to the dryer vent opening, to catch the lint as you clean it out. The mess you'll make, done to show you what we cleaned out. The wet-dry vac attachments to avoid a mess! So the actual task of cleaning the dryer vent isn't that difficult. Probably the biggest challenge is moving the dryer to access the vent and please, don't forget to unplug the dryer. This is also a job better done by two people, or at least the heavy lifting as dryers unlike refrigerators, aren't made to roll out … so thanks to my husband for lending a helping hand! Ready to clean your dryer vent?